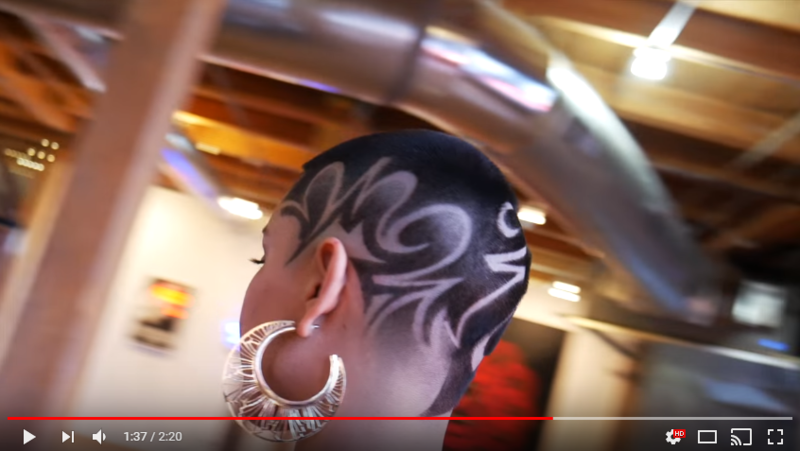 Trimmer for hair tattoo designs? Explores the differences between trimmers and hair etching pens used for hair tattoo designs. Hair tattoo designs empower both clients and stylists; creating an outlet for self-expression and artistic merit. However, quality hair tattoo designs requires a great deal of skill and most importantly – tools! Trimmers and hair etching pens offer different benefits depending upon the look you are going for as well as your comfort and skill level. When it comes to creating hair tattoo designs, there is no doubt that a good trimmer is a must! Every barber and hair stylist typically invests in at least one high quality trimmer. Trimmers have long been used to create hair art designs with incredible detail. I feel it’s important to mention that “hair tattoos” were known as designs in barbershops decades before the trend became popularized by social media. We have great respect for the tools barbers have long used to create incredible works of art. Considering the popularity and rise of hair tattoos, it would be an injustice not to pay homage to the artists that created the foundation. Likewise, it is important for us all to understand the origins of this art form. There is major history here! After you explored some history, take a look at this incredible collab by Los Star and Barber Diaz. Seriously. Dope AF and totally mesmerizing. In most cases, trimmers must be used alongside a hair etching pen to create that perfect design. That being said, neither trimmers or hair pens are better than the other. They do, however, serve different purposes. Let’s start by taking a look hair design trimmers and how they are used to create hair tattoo designs. The first step to creating incredible hair tattoo designs is preparing the proper canvas. Trimming or fading the hair down to the desired length is a crucial first step. Traditionally speaking, a variety of tools are utilized including straight-edge razors and clippers. Of course, much of this depends upon hair length and preferences. Carving small curves and circles with hair design trimmers takes finesse, experience and a very steady hand. This is where the hair pen comes in and is incredibly useful. Using the hair etching pen is much like painting. Your hair etching designs can be incredibly precise like artistic realism or more fanciful like henna art. Having a steady hand is important as well as some level of artistic skill. Of course, you can always utilize a template such as this free lotus flower undercut design template. Or, make your own. Simply trace your design with an eyeliner pencil directly onto the shaved region that you plan to etch your design on. This particular design was created using clippers and the incredible artistry of B.K Style. However, it is a good example of the type of hair tattoo design that would be well suited for hair pen work (curves, angles, circular). The benefits of this is that it gives you a great deal of control over the look and feel of the design. Additionally, creating curved lines and circles with a hair etching pen is relatively simple as the razor is very small and you are able to navigate your “canvas” similarly to how an artist draws on paper. Let’s recap and review these two powerful tools! Whether you utilize a trimmer, a hair etching pen or both, either can be used to create incredible undercut designs, nape designs and side shave designs. Always practice your art with safety in mind. Important to note, hair etching pens come with tiny micro-sized razors that are very useful in creating intricate designs with great complexity. However, these small razors are VERY sharp and can cut the skin if you are not careful. Etch your hair tattoo designs with great care, pay attention to accuracy and draw guidelines when you are just not sure how something is going to turn out! Trimmers and hair pens are equally useful for hair tattoo designs. Take your personal skill level into consideration as well as what you really want your design to look like. We hope you enjoyed this article and encourage you to leave your questions and comments below. We’ll get back to you asap!